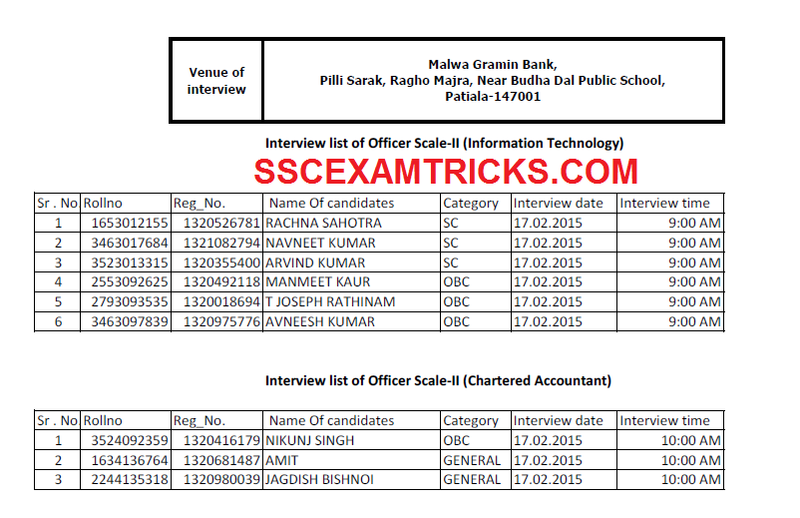 Malda Gramin Bank (MGB) has declared the result / list of short listed candidates for the interview for the post of Officers scale I, II & III in various trades i.e. Information Technology, Charted Accountant, Law, Agriculture, General Banking Officers based up on the performance of candidates in IBPS RRB CWE III held in the month of September/ October 2014. The interview schedule of short listed candidates has been released on the official website of MGB. Interview which will be conducted by MGB officials schedule from 17th February 2015 to 20th February 2015 at various time i.e. 9:00 AM, 10:00 AM, 11:00 AM, 1:30 PM & 2:00 PM. Those candidates who had applied and waiting for their result / interview list of candidates can download their result from the direct link provided in the end of the post. Earlier IBPS had successfully conducted written examination (CWE) in the month of September/October 2014 for officer Scale I, II & III at various centres in all over the country. Malda Gramin Bank invited application for the post of Officers Scale III on the basis of performance in IBPS CWE held in September /October 2014. Lots of IBPS qualified candidates had applied for these posts. A three times more than the requirements of candidates are called for Interview. The interview will be conducted for 30 marks. Merit list of the candidates for final selection based on Total Weighted Scores (TWS) obtained by them in CWE of IBPS and Personal Interview. The personal interview will be conducted in two steps.